Yep, as promised in the last post, Forget Me Not is done! Have just sent the chart off to the distributor, so it will be available shortly. As always, it will be available directly through my distributor's website, European Cross Stitch, or through your favourite needlework shop. 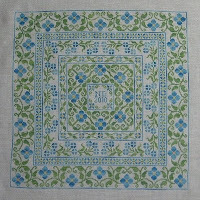 The model was stitched in Gloriana Silk floss on 40 ct Magnolia linen from Lakeside Linens. As always, I've included a DMC conversion. And for the first time - since this is my first piece that was cross stitch only - I've also included a stitch count for each colour, so that you can calculate how much floss you'll need, no matter what count you're using!! 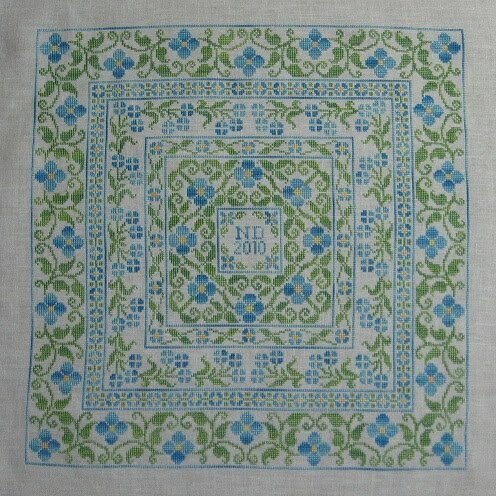 And another first - this is my first design that is suitable for any type of fabric - linen, plainweave OR aida. Hope you like it! And now I'm off to start stitching on my new, "super secret" project. No sneak peeks of this one will be shown, everyone will have to wait until the new year to see it! An absolutely beautiful piece! Congrats on getting it finished!